Mar 4, KUALA LUMPUR (SUN) — Today is the observance of the Festival of Jagannath Mishra. The Festival of Jagannath Mishra is an observance of the Jata karma samskara for baby Nimai (Sri Chaitanya Mahaprabhu). Following the fast for Gaura Purnima, which is broken upon the rising of the moon, the next day is held for feasting. On Jagannath Mishra festival day, the devotees meditate upon the Jata karman ceremony. The festival is also known as Anandotsava amongst the Gaudiya Matha devotees. Jagannath Mishra was born in the village of South Dhaka in Sylhet (Sylhet). His grandfather, Madhu Mishra, had four sons: Upendra, Rangada, Kirtida, and Kirtivasa. His father and mother, Upendra Mishra and Kalavati, had seven sons: Kamsari, Paramananda, Padmanabha, Sarveshvara, Jagannath Mishra, Janardana and Trailokyanath. (Prema-vilasa, 24). According to the Gaura-ganoddesha-dipika, Upendra was Krishna’s grandfather, the cowherd Parjanya, while Jagannath was Nanda Maharaj in Krishna’s Vraja pastimes (Gaura-ganoddesha-dipika 37). Nanda or Jagannath were, in Krishna’s various appearances, Kashyapa, Dasharath, Sutapa and Vasudeva. The king of Vraja has become Chaitanya’s father, Jagannath; the queen of Vraja is his mother Sachi. The son of Nanda is Chaitanya Gosai, and Baladeva is his brother Nityananda. In the Chaitanya Charitamrita, it is also stated that Jagannath Mishra was also known by his title Purandara, which is an epithet of Indra. His wife’s name was Sachidevi. Sachi’s father was Nilambara Cakravarti. At first, eight baby girls were born to Jagannath and Sachi, but each of them died at birth. Jagannath then performed a special ceremony to have a son, and not long afterward a boy, Vishvarupa, was born. Vishvarupa is a manifestation of Baladeva and belongs to the same ontological category that is named Sankarshan in the spiritual world. At the age of 12, Vishvarupa took sannyasa, adopting the name Shankararanya. He died in the year 1509 in Pandharpur, in the Solapur district of Maharashtra. When Sachi and Jagannath saw their child’s face, they forgot themselves in their excitement. Nilambara Chakravarti was a great astrologer and when he examined the constellations at the baby’s birth, he divined that he was to be a king among kings, that he was to possess all virtues, indeed that he was Narayan himself. Jagannath and his entire household were immersed in the ocean of ecstasy upon hearing these predictions. This ocean only increased in fullness as the baby Nimai began to display his childhood pastimes. Whenever Nimai cried, the adults would sing the Holy Names in order to pacify him. When he was only four months old, he started throwing various household articles about, but would only do this until he saw his mother when would lie down and start to cry. Sachi would sing the Holy Names to stop Nimai from crying, and only when he had stopped would she notice the disorder into which the child had put the room. Never suspecting him, she though that it must be some evil spirit whose efforts to harm the baby had failed due to the protective incantations she was always making over him. When the time came for Nimai’s name-giving ceremony, Nilambara Chakravarti and other learned men in the community called him Vishvambhara, which is thus his principal name, while the women gave him the name Nimai. This latter name was given because neem leaves have a bitter taste and are said to keep death away, and they wished to bless Nimai with a long life. The name-giving ceremony is also the occasion when a child’s tastes and tendencies are tested. Jagannath placed rice, puffed rice, gold, silver and a manuscript of the Srimad Bhagavatam before the child, who ignored everything to reach out for the Bhagavatam. All were delighted by Nimai’s choice. The philosophers amongst them began to say, “Nimai will be a great scholar.” In fact, Nimai wished to show, even at this young age, that the Bhagavatam is the supreme authority in spiritual matters. This is the teaching hidden within this lila. The neighborhood women found that whenever they loudly chanted the names of the Lord, Nimai would stop crying and start dancing in ecstasy, even rolling about in the dust. So every morning they would surround him and sing the Holy Names. Whether they knew him or not, people would be attracted by his beautiful appearance and would affectionately give him sandesha sweets or bananas. Nimai would take all these sweets and fruits and give them as prasad to the women who sang for him. One day, Jagannath Mishra asked Nimai to bring him a book from inside the house. When Nimai ran to fetch it, Sachi was surprised to hear the wondrous jingling of ankle bells. After Nimai had given his father the book and gone off to play, Sachi was amazed to see that his footprints held the auspicious signs of the flag, the lightning bolt, the elephant rod and the banner. Under the influence of their parental love, Jagannath and Sachi were not able to accept that these were Nimai’s footprints, but took them rather to be the traces of Damodar, their household Shalagrama-shila deity and so they did a special ceremony for him, bathing him, peforming the puja and offering food. This time, Nimai’s older brother Vishvarupa begged the Brahmin to try a third time, and so finally, on his insistence, he began to cook again. This time it was quite late at night and Nimai was fast asleep in his room so no one suspected any trouble. The Brahmin waited until the entire household had gone to bed before making his offering, but once again, contrary to all expectation, Gaura Gopal came to consume it. This time, however, he gave the Brahmin a vision of an astonishing eight-armed form, holding not only the conch, discus, mace and lotus in four of his hands, but a lump of butter from which he was taking pieces and a flute which he was playing with the others. When he saw this wonderful vision, the Brahmin fainted. Some time after this, Nimai’s sacred thread ceremony was held, after which Nimai went out to beg, just as Vamana did. Afterward, Jagannath entrusted him to Ganga Das Pandit, who is none other than the same Sandipani Muni who taught Krishna. 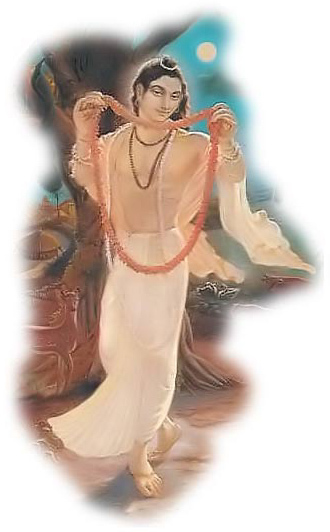 Ganga Das Pandit was overjoyed to accept the handsome and virtuous boy Nimai as his student. Nimai would ask him and his fellow students trick questions based on Nyaya and the ensuing arguments would be a source of amazement to everyone. Entry filed under: Uncategorized. Tags: Special Days.